The EA calculates the differences between positive and negative price movements and opens a trade in the direction of the positive difference if it exceeds price_slippage. The EA can run on any timeframe and any currency pair. Working pairs: EURJPY, EURUSD, USDJPY and GBPUSD. The EA uses data from the M1 timeframe for entries. Open active М1 charts for traded symbols: EURJPY, EURUSD, USDJPY and GBPUSD. Make sure that your broker's symbol names match the ones set by the EA. Attach the EA to each chart. Watch the video for more details. The robot will set a separate magic number for each symbol. Thus, each EA instance works with its own data flow without interfering with the others. It is recommended to perform the above steps on a demo account and move on to a real one after two-three days. If the market is active, the EA performs more orders. This is convenient when working with brokers offering volume based discounts. The nominal amount of transactions for a currency pair is approximately 5 trades per day. If you work with 4 currency pairs, it means about 20 trades a day. The robot cannot be tested on all symbols due to the tester limitations. Test it for each individual symbol instead. The minimum amount of an account per currency pair is approximately $100. 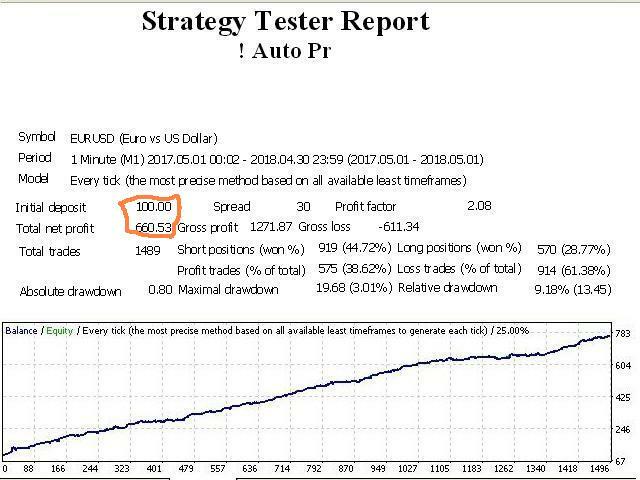 If you run the Expert Advisor on more than one currency, then you need $100 per each currency with a lot of 0.01 and a leverage of 1:100. For all four currency pairs, you will need at least $400. Mode — lot size calculation mode. If Mode=true, the EA automatically defines Lots. If Mode=false, you set a lot size manually. If Mode=false, and you have set Lots incorrectly, the EA adjusts it. Risk — risk parameter. If Risk = 10, this means 10% of the account. Magic — magic number of orders to make all orders of the EA unique. Trail — trailing stop connection mode. If Trail=true, trailing stop is enabled. TrailStop(38 = 0.0038) — trailing stop control parameter. TrailStep(21 = 0.0021) — trailing stop control parameter. MinProfit(10 = 0.0010) — trailing stop management parameter. 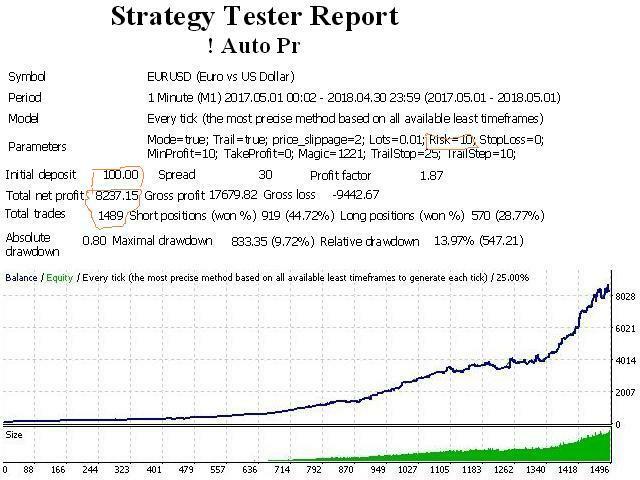 StopLoss (45 = 0.0045) — stop loss management parameter. 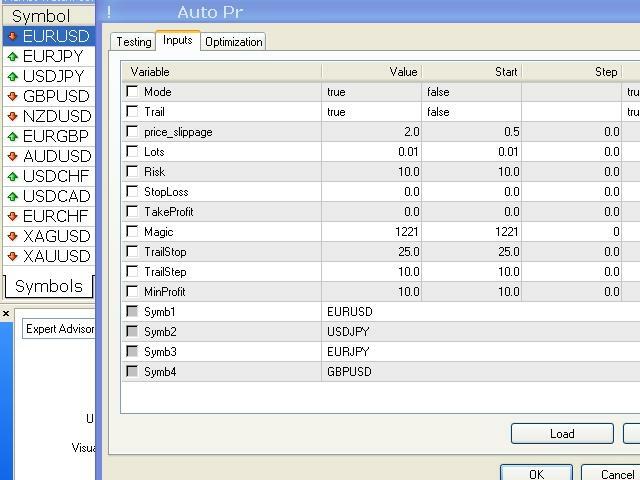 TakeProfit (200 = 0.0200) — take profit management parameter. Symb1 = "EURUSD" — set a symbol for EURUSD chart. Symb2 = "USDJPY" — set a symbol for USDJPY chart. Symb3= "EURJPY" — set a symbol for EURJPY chart. Symb4 = "GBPUSD" — set a symbol for GBPUSD chart. You can change any of the pairs. To replace EURUSD with AUDUSD, set Symb1 = "AUDUSD". The data is taken from M1.